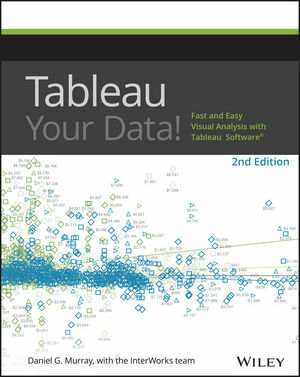 Tableau is designed specifically to provide fast and easy visual analytics. The intuitive drag-and-drop interface helps you create interactive reports, dashboards, and visualizations, all without any special or advanced training. This all new edition of Tableau Your Data! is your Tableau companion, helping you get the most out of this invaluable business toolset. Tableau Your Data! shows you how to build dynamic, best of breed visualizations using the Tableau Software toolset. This comprehensive guide covers the core feature set for data analytics, and provides clear step-by-step guidance toward best practices and advanced techniques that go way beyond the user manual. You'll learn how Tableau is different from traditional business information analysis tools, and how to navigate your way around the Tableau 9.0 desktop before delving into functions and calculations, as well as sharing with the Tableau Server. Tableau helps you unlock the stories within the numbers, and Tableau Your Data! puts the software's full functionality right at your fingertips. DANIEL G. MURRAY founded the InterWorks Tableau/BI practice in 2008, laying the foundation for InterWorks to become the premier Gold Professional Consulting Partner for Tableau Software. He is an in-demand speaker and was a Tableau Zen Master from 2014 to 2015.